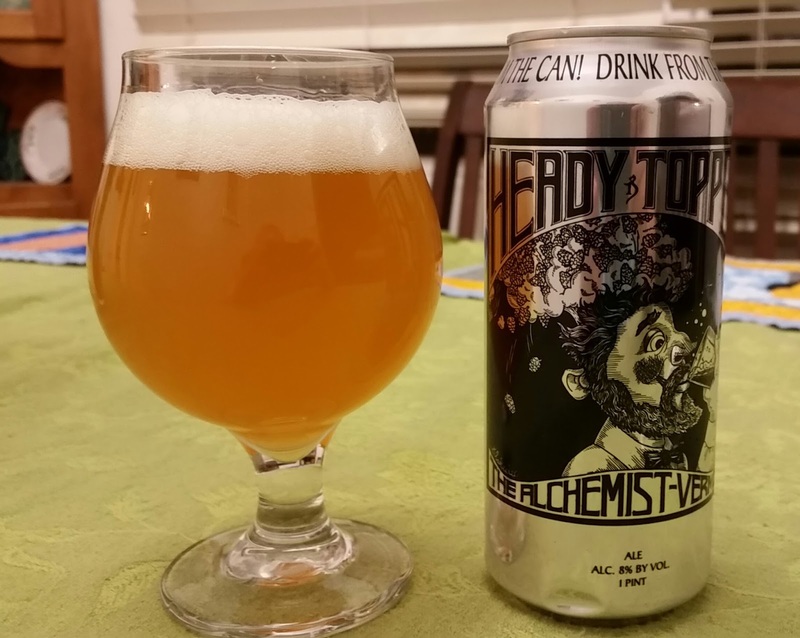 A friend was out east recently, and brought me back a can of Heady Topper! I’ve never had this legendary beer before, so I thought I would really slow down and savor the experience by doing a formal tasting. Here it is! I disobeyed the directions on the can, and poured most of the contents into a glass. I left a bit in the can, though, and talk about the distinctions at the end of the post. Hazy light gold beer, with a thick and sticky cream-colored head that leaves some fine lacing on the glass. Piney and slightly dank aroma, with a hint of peach/apricot behind it. As the beer settles down, the aroma is milder. Definitely hop-forward, with a smooth and well-rounded bitterness that ramps up as I drink it. The hop character is quite resiny and piney. I don’t pick up much in the way of other flavors, but that might just be my palate. Malts are in the background; I can’t say anything in particular about them. The beer has a medium body, with a slick mouthfeel; it really coats the tongue. I’m guessing that must be the hops. Is it that different in the glass versus from the can? Not in flavor, certainly. I perceive the aroma as different, but I think that’s largely because of the metallic aroma from the can itself. This shifts the overall aroma more towards the citrusy side–very interesting, but definitely not a “real” character of the beer. This entry was posted in double IPA, India Pale Ale, IPA and tagged DIPA, Heady Topper. Bookmark the permalink.